Paul Dry Books, 9781589880887, 222pp. "Part fiction, part overview of 'Aha ' moments in the forward march of physics, Only the Longest Threads takes readers dramatically through scientific fields such as quantum field theory, electromagnetism, relativity, quantum mechanics, and string theory. Each idea or concept is explored in an inventive chapter, each told from a different first-person narrator; the faux emails, letters, and diary entries take place from 1728 to the present day." --Boing Boing, "The Best Books for Nerds from 2014"
Only the Longest Threads will thrill readers with its dramatic and lucid accounts of the great breakthroughs in the history of physics--classical mechanics, electromagnetism, relativity, quantum mechanics, quantum field theory, and string theory, each from the viewpoint of a (fictional) witness to the events. Tasneem Zehra Husain re-imagines the pivotal moments in the history of physics when radical new theories shifted our perception of the universe, and our place in it. Husain immerses the reader in the immediacy and excitement of the discoveries--and she guides us as we begin to understand the underlying science and to grasp the revolutionary step forward each of these milestones represents. 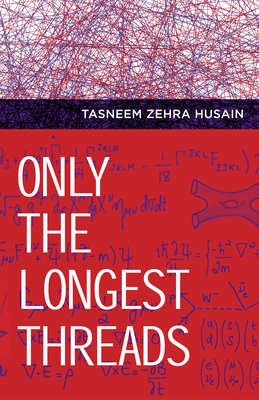 Tasneem Zehra Husain is a writer, educator, and Pakistan's first female string theorist. Tasneem Zehra Husain is a writer, educator and Pakistan's first female string theorist. She holds a PhD from Stockholm University and did post-doctoral research at Harvard University. Husain is fascinated by scientific theories, how we engage with them, and how they change us. She explores these themes in her fiction and nonfiction writing, her popular talks, and the educational workshops she conducts for science teachers. Husain is actively involved in science outreach, and frequently delivers talks about theoretical physics to students and lay audiences. She lives in Cambridge, Massachusetts.